My name is Tommy and I don't want any presents for Christmas this year. All I want to know is if you can answer some of my questions. You see Santa, I am a ten-year-old white boy living in the United States and I am very confused. I sincerely hope that you will have the answers to my questions. My first question Santa is this, why is it that I am constantly told that I am inherently racist even though I have never called anyone the n-word or used any other derogatory word to refer to people of another ethnic group? When Jaquan bullies me in school and calls me a cracka' or trailer trash is Jaquan being racist? How about when Jose calls me gringo and Ahmed calls me infidel? Another thing I want to know Santa is what is this privilege that people continuously say that I have? At school I still have to work just as hard as everyone else yet the best grade that I have ever gotten is a B. Lee and Mahindra consistently outperform me in Math and Science and are straight A students, yet I am told that I have white privilege. 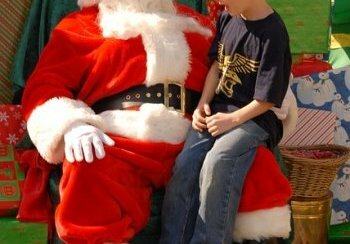 Do you know what white privilege is Santa? What I can't understand Santa is why is it that people say that I have white privilege yet when I tried out for the school basketball team all of the players who were selected looked like Jaquan and when I tried out for the soccer team all of the players who were selected looked like Jose even though I knew for a fact that I performed better than a lot of them. I was told that I would have better luck trying out for the ice hockey team. But I don't even like ice hockey. Was I being stereotyped there? Also, how can I have white privilege when I live in a trailer park with my mom who has to work two jobs to support me and my little brother Brian because my deadbeat, abusive, alcoholic dad left us and I don't have a clue as to where he is right now? Just the other day in school I was taken to task by Jaquan for having an Alex Morgan poster on the inside of my locker. When I asked him about his Serena Williams poster, he proceeded to shove me in the chest. I simply backed away knowing that it would not have made sense fighting. On another occasion Ahmed told me that he and his people will eventually rule America one day and that infidels like me will be made slaves or be executed. Why am I being treated like this and why am I and other white people continuously being blamed for things we have never done? Would it be okay if I blame Ahmed for what ISIS does? Or Jaquan for when Black Lives Matter commit acts of violence? Please Santa I need your help and I know that you are very smart. Can you magically give me the answers to my questions the same way you deliver all those toys to those children in every part of the world on Christmas Eve night? Absolutely spot on. There are plenty of superb stories on the web, but this is silly.